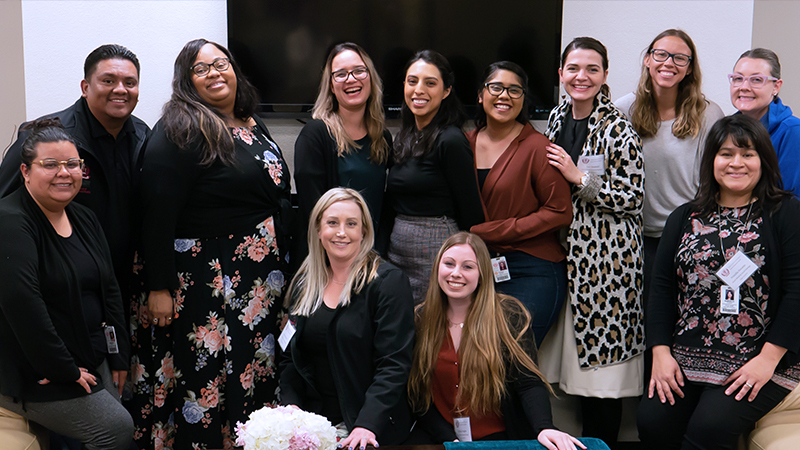 A special mixer for alumni from the School of Behavioral Health was held on February 28 during Loma Linda University Health’s annual Homecoming weekend. Hosted in the Department of Psychology, alumni, faculty, and family turned out to enjoy a photo booth, a variety of door prizes (including a pen ink drawing by Dr. Beverly Buckles as well as hand turned pottery and a pen by Professor Terry Forrester), as well as delicious hors d’oeuvres and hot beverages. Dr. Adam Aréchiga was the master of ceremonies for the mixer, a relaxed event that provided the opportunity for alumni to reconnect with one another and their professors. Dr. Buckles enjoyed meeting with many of the alumni to hear the latest news on their careers and families. The setting provided a wonderful opportunity for alumni to hear about the many exciting developments in their respective departments. Some of these changes include the DMFT program going online in 2019-20, the addition of an online MSW program beginning Fall 2019, the infusion of military content within curricula, and a summer gateway program being offered to high school seniors and community college students that focuses on careers in mental health. ► View more photos from the event here. ► Download digital copies of the photo booth photos here.